Holiday site success savings start now! We’ve got a bigger than usual Tips Tuesday this week because there is so much site news happening right now. Yep, it’s that time of year. The BlogAid Holiday Sales for 2018 are posted. If you’re ready to get your site on a solid foundation and make more money in 2019, now is the time to get in on special pricing to help you do it. I’ll have a post out for you tomorrow on the steps you need to take prior to WordPress 5.0 rolling out next week. I strongly advise that you do not update to WP 5.0, but you’ll want to take these steps before next Tuesday, when it’s scheduled to arrive, to prep for the changes now, especially with your plugins. I’m really doing well with catching up on my backlog of tutorials to make and I’ve got two more in the works right now. If you want to delete the Yoast SEO premium plugin, you have to be careful not to lose all of the redirects it auto created for you. There’s an easy way to import them to the Redirection plugin and I’ll have a post with all the details for you soon. 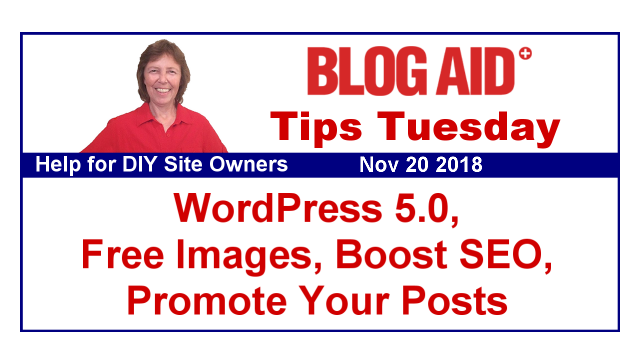 I want to thank Marilyn Lesniak of Marilyn’s Treats and Harriet Yoder of Lamp Post Home School for their invaluable help in making this Yoast SEO redirect tutorial. And, if you want to get rid of the Pretty Links plugin because all the logs it generates are chewing up your database, I’m researching the easiest way to export them to the Redirection plugin too. Plus, the Redirection plugin itself isn’t exactly intuitive, so I’ll be making a tutorial on that for creating redirects on the fly. Also, there’s really no need to create a redirect just to make a shortlink for your own posts. I’ll have a tutorial with a super easy trick on that as well. It’s same trick I used for the holiday sales post above. This week I’m revamping the Jumpstart Challenge for Dec, where we check our critical Yoast SEO settings and Google Connections. Folks really liked those last time as a way to prep for the new workshops that start in January. Even folks who thought they had everything set up right were missing a few things. So, they are definitely worthwhile. The current workshop replays will be coming down soon as I revamp the topic list. Besides bringing the current topics up to speed with how SEO has changed, we have a bunch of new things to cover this time, like the proper way to delete old content so you don’t cause a bunch of unexpected 404s. And, I’ll have updates for changes to our robots.txt file based on what we’re seeing in the new Google Search Console interface too. So, even if you’ve been through the Workshops last year, or have been digging into the replays, there’s plenty of new info coming to make it worthwhile to take the workshops again. Due to the Thanksgiving holiday, we’ll be skipping a week in our GSC Live Labs for the DIY SEO course. We’ll be meeting again next week, so do jump into that last Lab when you have time between now and then so you’ll have your questions ready for our live session. I hope you had a chance to read my post last week on deleting cache all over. This is critically important for checking your site after major changes or fixes, or for troubleshooting. As y’all know, I’m in the process of turning my hobby carving site into a passive income woodworking site. I got entirely overwhelmed with the theme and site content revamp, mainly because I don’t know for sure what the new content will be. So, I decided to think of this as starting a new site from scratch. I’ll be creating 4-5 new post drafts, and that will help me revamp the actual site when I get ready to publish them. And I may start with a new theme entirely too, as a way to detour around the mental block I have with revamping the current look. The main focus for the first part of the year is going to be on the new shop build and all the new tools I’ll be getting. I have at least 20-30 post ideas right off the top of my head for that alone. I also had consults with a couple of my clients that have hugely successful sites of this type to ensure that my entire project outline is good. I don’t want to get started on the wrong foot, with the wrong foundation, and have to later dismantle what I’ve built, or discover I missed something critical. Once I get going with everything, I may decide to start blogging about the journey of what it’s like to build a site from scratch into a passive money maker. And, I’m using that site as the base of my DIY SEO tutorials too, since I’m watching the growth on it like a hawk, as many of you do that have similar passive income sites. My hope is to have a serious injection of joy with this new venture, and to learn more about the passive income niche from the inside out. I’m sure what I learn will spill over into BlogAid, which is a good thing too. In my mind, a service based business site is very different from a passive income site. Just like a physical product based site is different from either of those. So, I’m really looking forward to putting myself out there in a whole other way and enjoying social media and video in a whole other way too. The first Release Candidate for WP 5.0 was supposed to come out yesterday, but it has been delayed. I’m going through it with a fine-toothed comb on my test site to see the fixes. And, I’m doing my best to bring myself up to speed with the changes that have been coming lightning fast over the past couple of weeks during the beta releases. There have been 5 beta versions. I can’t remember the last time any WP release went through this much change during beta testing. That speaks volumes about how many bugs were found. And, it’s the main reason I strongly suggest none of us update to WP 5.0 on our production sites after the official release later this month. In fact, I suggest you also postpone any plugin updates that come out after the 5.0 release next week. Re-read the above statements to ensure you are super clear on what to do and when. And look for my post on it tomorrow with more details. Your best bet is to follow me closely on BlogAid News for when to update what. It may even be next year before we do this update. It’s not just about turning off Gutenberg. There are lots of other core code changes. But you don’t need to do any of them now. Wait for me to give the green light on any changes with this. Long time WP user and dev, Matt Cromwell is also suggesting we do no updates of any kind the week that WP 5.0 rolls out. The Gutenberg Times site is a super way to keep up with the news from all over the web about Gutenberg and the WP 5.0 release. Webmasters, if you’re not following this site already, you need to. In last week’s Tips Tuesday I reported hearing a rumor that after WP 5.0 releases, we should expect minor updates every 2 weeks. That rumor has been confirmed. And that’s just one more reason why we will keep the Easy Updates Manager plugin on our sites, or our hard-coded ways of turning off auto updates of any kind. WordCamp U.S. 2018 is right around the corner and runs Dec 7-9. It’s in Nashville again this year. And after very careful consideration, I’ve decided not to attend in person. The sessions I want most to see are first up every morning or at the end of the day, and I simply don’t trust being able to get there on time or being comfortable passing the time between sessions unless I stay in a hotel for the whole thing. And with the house and all, the budget is a little too tight this year for hotels, and/or parking, which is insanely high in downtown Nashville, and boarding the dog. The saving grace is that they stream the sessions for free. And I suggest you also register to get the livestreams too. See the schedule to pick your sessions now and mark your calendars. In the past two weeks you’ve heard me talking about the need for us to update our PHP version at our host before the end of the year. I even had a private live session with my Site Audit Plus clients about it. I’m strongly suggesting that you consider staying at the PHP level you’re on if it is at least 7.0 until after you update to WP 5.0 or that you test right now to give time to ensure all is well with an upgrade. The reason why is your site is working now and you want to ensure that if your site doesn’t work after the WP update that you know for sure it’s WP giving you fits. Now, that fit may be your PHP version, as they are only testing WP 5.0 with PHP 7.3, but at least you’ll be sure of that. And that’s whack for them to only test with 7.3, as that PHP level is not even available at all hosts because it isn’t fully stable yet. But, if you want to test your current site with a different PHP version now, you can. In fact, I made a tutorial to help you do that. In the tutorial I cover doing the change on both SiteGround and A2 Hosting, and with both popular interfaces on cPanel, meaning the old and new interfaces. Several of you have reported that there is a bug at SiteGround where you can’t see your current PHP version. Don’t worry about that. Assume it is at least 7.0 and do the update test. You can always set it back to 7.0, or even 5.6 if you have to in order to get your site working again. But don’t go any lower than that. In fact, if you’re at 5.6, you must upgrade to some version of 7.0 immediately as you will be in a world of hurt for even plugin updates in the near future. You can read my post on how to check your site for PHP 7.0 compatibility, but that method is now becoming less reliable, as many plugins and themes have updated to be backwards compatible, which means that the test will throw a lot of false flags. And, it’s practically useless for reliable testing from one 7.x version to another. And, it’s a resource hog. So, your best bet is to just flip the switch and jump to another version and see what happens. You can always set it back. Some site owners are reporting an error with the Cloudflare plugin when they switch to PHP 7.2. You’ll see that error when you try to save a post/page, even if you’re only saving as a draft. Just use your browser’s Back button to return to your site and with that editor window still open, go change your PHP level at your host and try to save again. Some folks have to log out of the site, change the PHP version, and purge cache everywhere to clear the error. That includes waiting 10-15 minutes for the cache to fully purge and start rebuilding. This is not happening for everyone, and I have yet to find the common cause for it, but I did want to at least report it, in case you run into it. This week I’ll be posting on the Cloudflare support forum about it, as I’m currently working with a client that has this issue, so we have a site to test on. And this is the mess we’ll be facing for all of next year, at least. As hosts and themes and plugins and even WordPress itself keep evolving, there will be no standard for them to meet any particular PHP version compliance. So, you could get into a situation where a certain PHP level breaks something and updating your PHP level fixes that, but breaks something else. I won’t be keeping a public post of compatibility, as that will be impossible to keep updated over time, but I will be keeping a running doc for both my Site Audit Plus clients as well as my Webmaster Training folks for the issues and conflicts they report. So, if you’re in either one of those groups, please do post in our Facebook groups about what you’re seeing and I’ll add those to the doc. I’ll get a link to the doc for you as soon as I can. My buddy Mark Traphagen has a stellar post that bust myths and gives you the real skinny on how your social media impacts your SEO. Plus, he gives clear strategies for making both better. This is a must-read post for all site owners who are serious about getting more eyeballs on their content from all sources. Read, study it, put it into practice. I never, ever tire of reading this post from Denise Wakeman on all the ways there are to promote your blog post. I think this checklist got started during a Blab interview I did with Denise a few years ago and she listed 12 ways right off the top of her head during that show. She’s up to 27 ways now. This is another must-read post for folks serious about getting eyeballs. Start with just one way that you’re not doing now. Then come back to this post and add another. Repeat, and repeat again until you’ve got yourself established on more platforms, or better uses for the platforms you’re already on. And watch your traffic grow. And be sure to follow Denise because she loves new adventures and she’s constantly trying new things. She’ll keep you on the bleeding edge of where new audiences are cropping up. Genesis rolled out a major update last week. Most of the changes are background coding, and it did cause issues for a few folks. We’re already up to version 2.7.1 and I’m betting 2.7.2 may be in the works. I’ll be waiting until this weekend to update, just ‘coz. Please do report what you’re seeing with it, if you’ve already updated, including good, bad, and ugly. You might want to let us know what theme you’re using too. Leave a comment here on the blog so the whole village benefits. Google has a new app that can optimize your images for .jpg, .png, and their new format WebP. To be honest, I’m leery of the WebP format, as it was invented by Google and no one else in the internet community is adopting it. The only folks I see pushing for it use the horribly inaccurate Google PageSpeed Insights to gauge how their site is doing and it is popping folks with low scores for not using this proprietary image format. Google has a long history of dropping support for things it invents due to low adoption rate and I believe this will be one more in that heap. There’s no way I’m leaving the tried and true formats for it. In a previous Tips Tuesday I reported a fluke with Pixabay and asked where y’all are getting your images. Here’s a list of all the places you reported, plus several that I found in other groups asking the same thing. If you’ve found a place for good photos not on this list, please do let us know in the comments. The internet highways use a protocol called HTTP. We were all using HTTP/1 until we converted to HTTPS, and then we could use the HTTP/2 protocol, as it required the HTTPS encryption. HTTP/2 is also faster. Think of it like the difference in a 2 lane and 4 lane highway. With HTTP/2, more site request elements can get to the destination faster because more of them are traveling in parallel, instead of in serial fashion – one behind the other. Now HTTP/3 protocol is in the making and it uses an entirely different method of transport and it’s way faster than what we have now. Think of it as going from traveling on the roads via car to traveling in the air via plane. The way data is compressed is changing too. Right now we rely heavily on Gzip compression. But a new Brotli compression is catching on. In fact, if you’re on Cloudflare, you already have it wherever it is supported. And it is faster. This will be another few years in the making, but I’m keeping my eyes on it for us, as it may require site changes to make use of it, just like HTTP/2 did with HTTPS. And you know I’ll keep you posted. But the bottom line is, mobile use is driving the need for speed, and visitors are going to become less tolerant of slow loading sites that aren’t keeping up with the new tech. A site audit will show you all of the drags on your site, including those on the backside at your host, and get your site fast so you keep more of your visitors. Another bumper bundle of goodies from you this week, MaAnna. She much of great value. Regarding free images, I have found freepik.com to be a great source or vectors and photos. Another worth checking is photopin.com. Thanks so much for the extra places to get images, Lin!!!! I look forward to following you on your wood site revamp journey and learning with you along the way. Thanks for showing me how to move my redirects over to the Redirection plugin. You made it so easy! #TipsTuesdayFan who’s waiting for the #MaAnnaGreenLight on WP5, Gutenberg, and Genesis 2.7. Delighted to have your help vetting the Yoast redirects tutorial, Harriet!!! I’ll be posting it a little later this month. Thanks for sharing my blog promotion checklist. I agree with your tip: start with a few promotion tactics that you’re not already doing, then once it’s mastered or automated, add the next one. Can’t wait to watch your tutorial on moving Pretty links to the redirection plugin! Always happy to share the good stuff, Denise!!!! And I’m looking forward to more eyeballs on both BlogAid and my new endeavor. Thanks for the mention of my imput in the Redirection plugin. I am looking forward to the live party!! Couldn’t do it without you, Marilyn!! Thanks, as always, MaAnna. I’m taking a week off after Thanksgiving, so I’ll just let everything sit as is until I return. Luckily, I turned off the automatic WordPress updates last time you recommended it. I’m on PHP 7.1, and my plug-ins are up-to-date as of today. I feel much better about taking a break because I have kept up on your posts, including Tips Tuesday. Happy Thanksgiving! It gives me a lot of peace knowing that I’ve got my peeps to a good place so we can all relax and enjoy the holiday weekend too!!!!! I wish I could get you to come and talk to the folks where I work about their outdated website and all the issues it causes AND the fact that one day it just may not work anymore! At least I have the comfort of knowing I’m listening to you and will continue to follow your advice for my personal website. A lot of site managers for companies, or even individuals, have this same issue. The site owner is suffering from what they don’t know that they don’t know. It’s up to the site manager to educate them, but it all too often falls on deaf ears. I’m glad you’re site is good and safe and ready for what’s next!!!!!! I’ve got about another month of strategic planning before I start posting in earnest and revamping my wood site. Already learning a lot myself! !